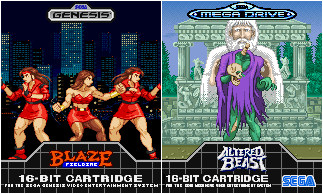 I’ve fixed up the sprites of Blaze Fielding (Streets of Rage) and Headless Horror (Altered Beast) and added them to their respective custom sprite galleries (links are their game titles) and the main GFX Generator. I’ll be back later this week with another, and much bigger, Unfinished Business update! edit: I’m back sooner than expected! I made more fixes to the Blaze sprites and replaced that older scratch-made sprite of SoR2 Blaze in the SoR3 bio screen pose. Crew completion, part 1: COLLECT THEM ALL! 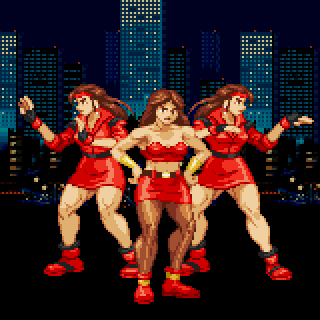 That completes the Streets of Rage 2 roster (finally! ), Super Mario Bros. 2, LJN’s X-Men game and Sega’s X-Men for the Genesis/Mega Drive. The Penguin sprite was the last character I needed to have one sprite or sprite edit of the original Super Powers figure lineup. 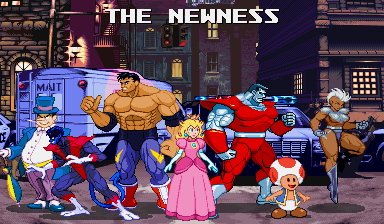 Mini-logos: Princess Peach (Super Princess Peach style) added to Nintendo section, Nightcrawler (’80s and Marvel Team-Up versions) added to Marvel section. All of those things have been added to the Graphic Generators so you can make your own fun graphics and screenshots with them, too. … can go there now and see the 90% finished redone version of it. I just couldn’t stand having the old version stinking up the joint any longer.